Do you relish the months in Arizona when the rain is infrequent and scarce? Are you dreading the monsoon season that is long awaited by many in this dry, torrid community? Is the roof of your Paradise Valley commercial business leaky and unreliable? Don’t worry. Paradise Valley Commercial Foam roofing by 1st Class Foam Roofing & Coating is here to help. With our excellent and top of the line foam roofing services, you don’t have to worry about rainy days or other causes of harmful roof damage. We have the experience and knowledge to make sure your roof lasts through the seasons. 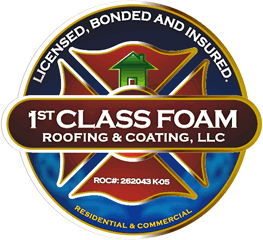 The highly trained professionals at 1st Class Foam Roofing & Coating are dedicated to giving you the best foam roofing services money can buy. Owner Jason Rivers has over seventeen years of roofing experience, and with a professional team of experienced roofers and sales associates, 1st Class Foam Roofing & Coating is just what you need to repair or replace that leaky, unreliable roof. With many different styles and options for commercial roofing, making the choice and be difficult. But with 1st Class Foam Roofing & Coating, it’s a piece of cake. Many people nowadays are concerned about the ecological mark they will leave on the world. If you are one of these people, and are worried about your carbon footprint, foam roofing by 1st Class Foam Roofing & Coating is just right for you. Our top rated foam roofing services will wash away your worries. The foam roofing application we offer is a form of green construction, which means that it is energy efficient in both the installation, and the maintenance of our product. It also reduces the energy output in your cooling and heating systems because of the effective insulation the foam roofing provides. In addition to being extremely energy efficient, foam roofing has an easy application process that is both quick and affordable. Like most commercial businesses, they have a low sloping roof, or even a flat roof, which makes them the perfect candidate for Paradise Valley Commercial Foam roofing installation. Ideal because of its thickness and ability to guard your building against the elements of mother nature, foam roofing is also 100% waterproof and will protect your commercial business for those long dreaded monsoons. It is also extremely adept at providing the best insulation for your building and keeping it up to code for a long time to come. With an A+ rating with the Better Business Bureau 100% five star reviews on Yelp, your satisfaction is guaranteed with Paradise Valley Commercial Foam Roofing by 1st Class Foam Roofing & Coating. Our professionals are prepared and dedicated to provide you with the best foam roofing money can buy. With affordable prices and friendly experts, your new Paradise Valley Commercial business foam roof will be worth every penny. Next time you find that your roof is leaky and damaged, come to 1st Class Foam Roofing & Coating and we will provide a free roof evaluation at no cost to you. And if you find that you aren’t happy with our services, you are at no obligation to continue with us. For more information about our Paradise Valle Commercial Business Foam roofing services, contact us today.